The puzzles in The Room series are equal parts captivating and haunting, but they have just one problem: you can’t use them to kill anybody after you’ve solved them. The Bard’s Tale IV takes its inspiration from The Room, but with weapons instead of rooms. The Bard’s Tale IV was Kickstarted by inXile back in 2015 and is now ready for alpha testing. I got to try a demo of the first-person dungeon-crawler at GDC in San Francisco. I came away impressed by its fusion of ability-stacking turn-based combat, environmental puzzle-solving, and bards. The thing that stood out to me most, though, was a single loot drop. The Bard’s Tale IV is modern spin on classic dungeon crawlers, and things in the demo started out typically enough. I defeated a gang of wizards who, in their pained final throes, farted out an assortment of weapons and items. Immediately after, however, I was approached by a man the wizards hadn’t quite finished killing, who had a sword stuck in the middle of his barely-attached face. He was mad that they didn’t finish the job and asked me to pull the sword out so that he could die. I complied. For my troubles, I received an Elven Puzzle Weapon. This was a steel sword made of multiple segments that I could look at and rotate. Its grip, guard, and pommel turned out to be individual puzzles that I could zoom in on and interact with. If I managed to solve them without too much trouble, the weapon would gain a stat or modifier like acid or fire damage. If I tried to brute force it, however, my shiny new Totally Not A Keyblade would come away tarnished by a stat-lowering curse. 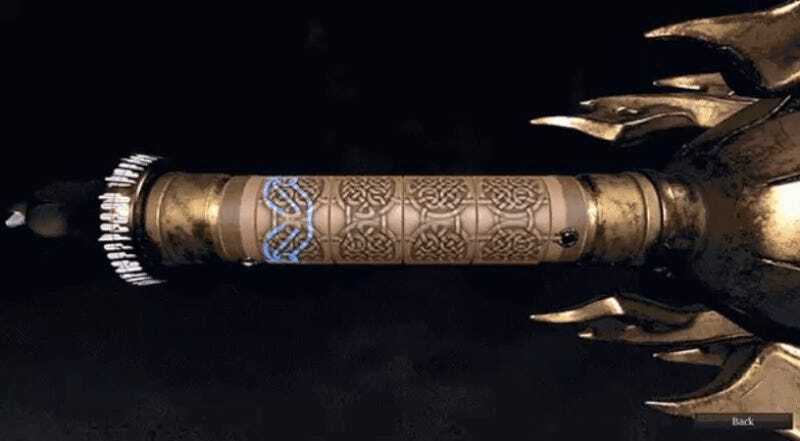 One puzzle centered around aligning ornate patterns on the hilt, while the other two involved riddles. The pommel riddle required me to pick from three gems that came with the sword like magical Duracell batteries, but the hilt riddle led to an optional goblin-killing quest outside the weapon menu. Lead designer David Rogers told me that he wants special weapons to represent a starting point instead of an immediately gratifying reward. Rogers was unabashed about the influence that led to this unique approach to RPG weaponry. He told me that inXile president Brian Fargo played The Room, fell in love on a level that not even professional The Room advocate Stephen Totilo can comprehend, and the rest was history. Weapon puzzles, however, won’t be the same for everybody. Rather, The Bard’s Tale IV will take stock of the puzzles you’ve already solved when generating new weapons. If we’re being real, I’ve been over loot-driven games for a while now, but this spin on the idea threatens to drag me back in. The Bard’s Tale IV will be out later this year.